I am just starting my third summer season exploring this place I now call home. Here is the story of how my summer with VisitScotland as a Coo-Viser started…. Before doing photography full time I have had jobs where I was “trapped” indoors for eight or even twelve hours a day! If I’m honest that really isn’t me, I am not very good at sitting for long periods of time or being held hostage in an air conditioned office. In March 2016 I read a rather interesting job description that involved being outdoors, meeting people and being passionate about Scotland. Short story even shorter: I applied. I had an interview. Got offered a job. Yay!!! A Coo-what I hear you shout. A Coo-Viser. As in someone who tends to highland coos (cows). Except I won’t be tending to real cattle, instead we (myself and seven others) look after three vans that look like Scotland’s famous cattle breed. The purpose of my job is to deliver outreach activities at events, attractions and locations across Scotland, engaging with locals, visitors and businesses too. Providing inspiration to visitors and extending the personal touch that the traditional information centre’s already have. We work closely with members of staff in the iCentres whilst making plans for the Coo’s to attend events in their area. Being “out in the field” means that information can be accessible and we can pass on details of attractions and other things to see in the area and across Scotland. The outreach programme is also a great way to make people aware they are able to buy tickets (sometimes with a discount) for attractions, book accommodation or tours in the VisitScotland iCentres across the country. For those of us that still like to send a postcard you can even buy those in there too. For me this role is SO much more than just a job. We moved to Scotland because we fell in love with the places we had visited, it’s diverse landscape, amazing wildlife and friendly people. Oh and no end of photo opportunities. I want to share my love for this place I now call home with others who have come to experience the Scots hospitality and wilderness. I want to help them scratch a bit deeper than the surface and find something they will take home and share with their family and friends. I plan to make my third summer with VisitScotland as a Coo-Viser one to remember. 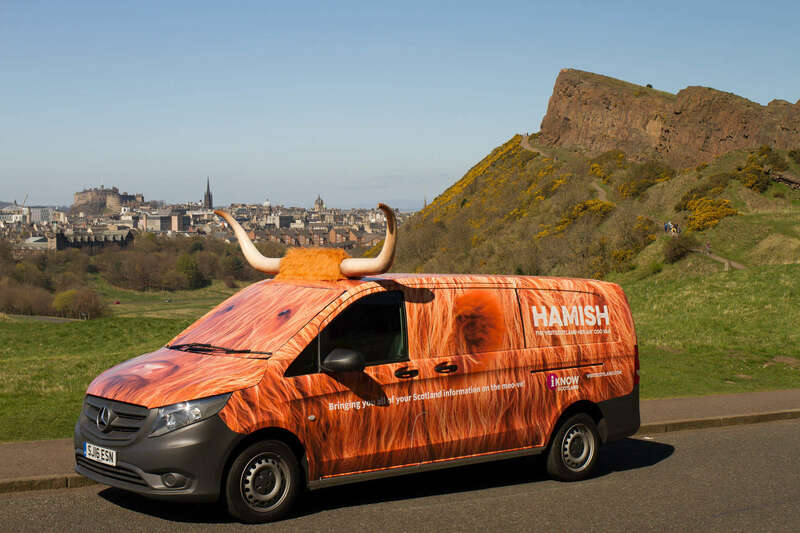 Having adventures in a van that looks like a Coo, travelling around Scotland, talking to people about something you are passionate about is not something a lot of people can lay claim too. So no sitting down for me this summer and plenty of fresh air, just have to remember there is no such thing as bad weather just inappropriate clothing. You can follow me on the blog Twitter account to find out where Hamish, Morag, Archie and Heather will be visiting. If you manage to get a selfie or a photo taken with Hamish and his friend’s then please use #ScotSpirit or #CooVan to share it with VisitScotland. Amazing, I’m so pleased for you. This is just the perfect job for you, getting out and about, taking photos, talking to people and writing about it so I know what you’ve been up to! I am sure you are going to have an amazing summer.